Home - Canopy of Neighbors, Inc. Learn more about Canopy's latest project, Changing the Face of Aging! Welcome to Canopy of Neighbors! If you're not familiar with the member "Village" concept, please enjoy the videos below. The first, from PBS, explains the village concept which began in Beacon Hill, Massachusetts. To date, there are over 350+ villages worldwide and growing in number. Villages vary in composition, size and offerings. Our village in Buffalo is an urban, inclusive and vibrant group that reflects the mosaic that is the city of Buffalo. The second video is an enlightening "Ted Talks" lecture that will empower you to stay active and join the village movement that looks to help you age well and age independently. 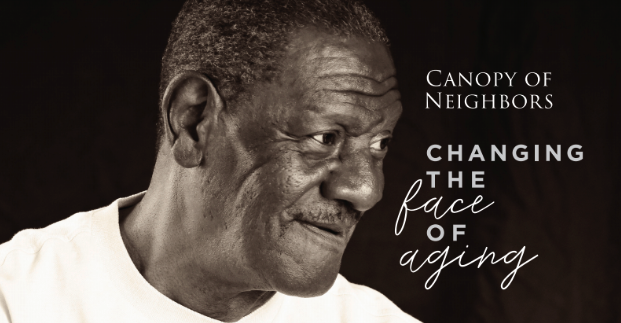 Canopy of Neighbors' mission is to create new pathways to aging well and aging independently in community. We are a membership organization with an annual membership fee, based on income level, whose goal is to make sure our members can age in place. We introduce our members to a wonderful world of fun and innovative programming that reduces social isolation – monthly lunch outings, movies, monthly speakers at our coffee hour, workshops for creative writing, monthly Mindfulness seminars, current events group, and live theater are just some of the enjoyable and meaningful opportunities to meet new people or just escape from your current responsibilities for a while. As you can see from the video above, alleviating social isolation leads to better health and wellness. Just as importantly, with a membership, Canopy offers door–to-door transportation to members’ medical, social and other appointments by caring and vetted volunteers. It takes a "Village" to return us to the days of neighbor helping neighbor with life’s “human services” that take the burden off of our members, their family and friends. Most popular of all, our friendly call program checks in weekly, updates you on our events, and and takes requests for transportation and other requests such as technology help, mattress flipping and even garden weeding to name a few! Our membership categories are based on income and, as a non-profit, we are grateful for the funding help we need to ensure that no one is turned away. To that end, we offer memberships that are Social only and enjoy tax benefits, Full and Subsidized memberships based on income, Snowbird memberships for those in Buffalo part-time and more. Please call Sasha Yerkovich, Executive Director at 716-235-8133 for information.